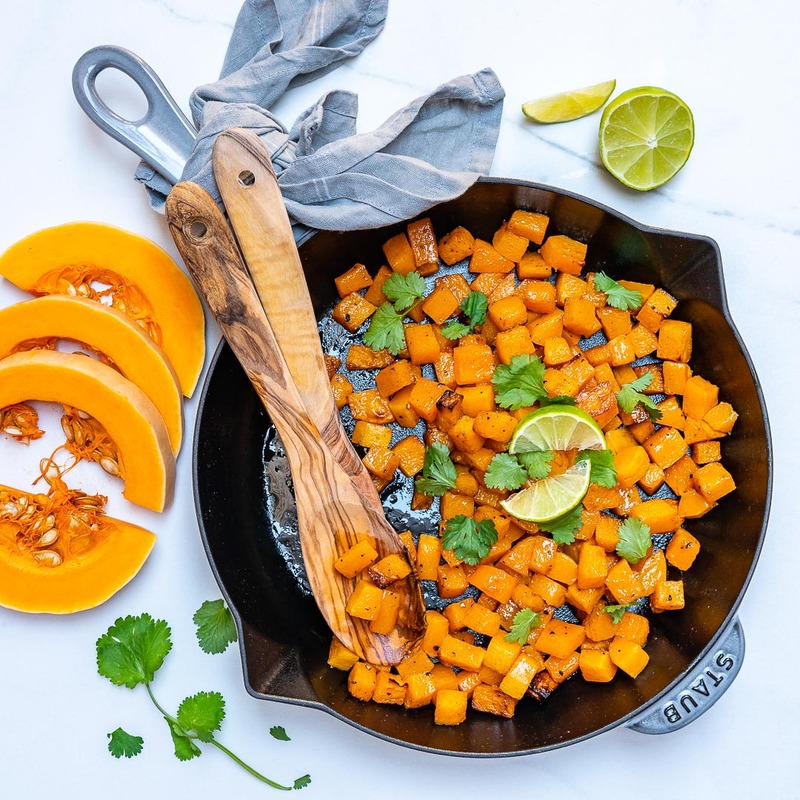 This Easy Butternut Squash Skillet Makes the Perfect Clean Eating Side Dish! This tangy, nutritious side dish comes together in about 20 minutes. Perfect for weeknight, food prep, or Thanksgiving dinner. 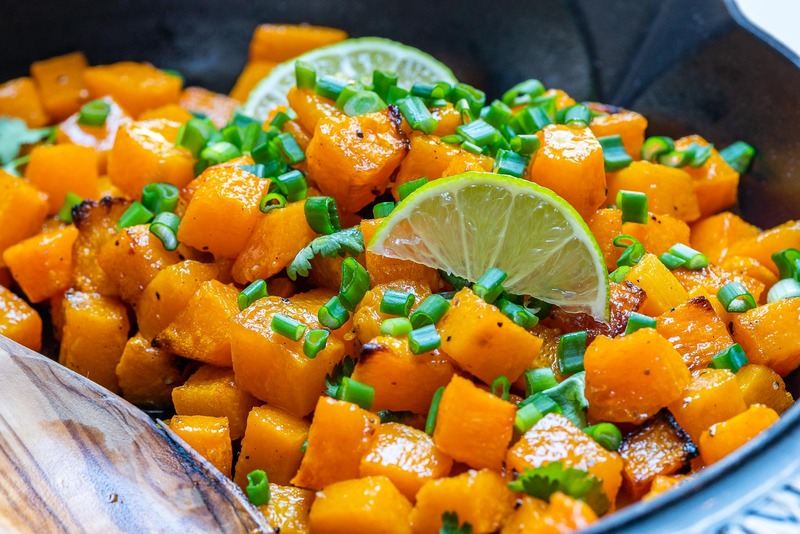 Butternut squash is extremely versatile and satisfying! 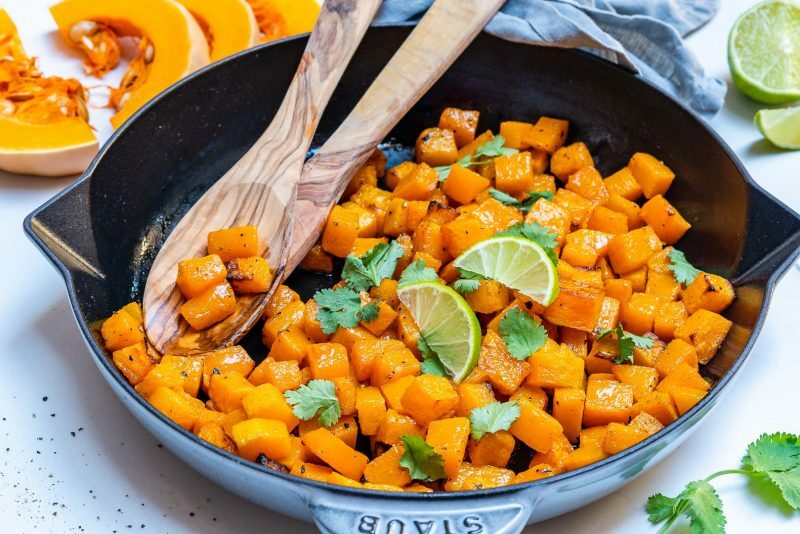 Be sure to try this during the Fall when squash is plentiful and inexpensive. Though technically a fruit since it contains seeds, butternut squash is a member of the gourd family. 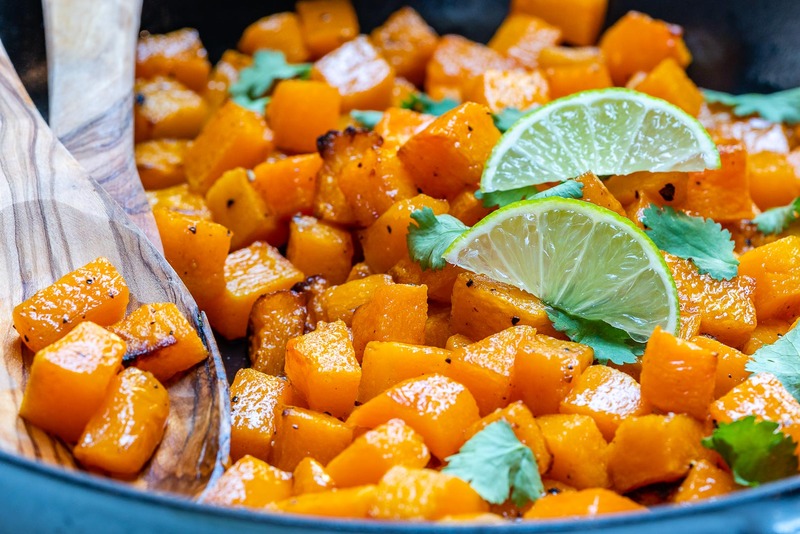 Try a serving of squash instead of your typical brown rice, quinoa, or sweet potatoes. Add butternut squash and saute for about 7-8 minutes, stirring occasionally. Be sure to keep a close eye on the squash so it doesn’t burn. Add in minced garlic and cumin. Season with sea salt and pepper to taste, then stir to combine. Reduce heat to medium-low and cover the skillet with a lid. 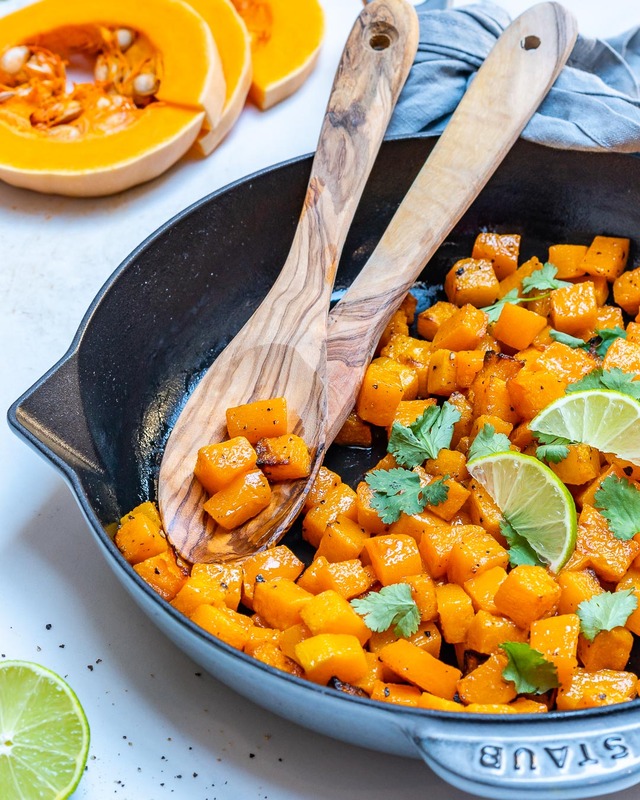 Cook for about 5 minutes more, until the squash is crisp tender – stirring once or twice. Garnish with lime wedges, cilantro and green onions. Enjoy! Heat oil in a large non-stick skillet over medium-high heat. Add butternut squash and saute for about 7-8 minutes, stirring occasionally. Be sure to keep a close eye on the squash so it doesn’t burn. Add in minced garlic and cumin. Season with sea salt and pepper to taste, then stir to combine. Reduce heat to medium-low and cover the skillet with a lid. 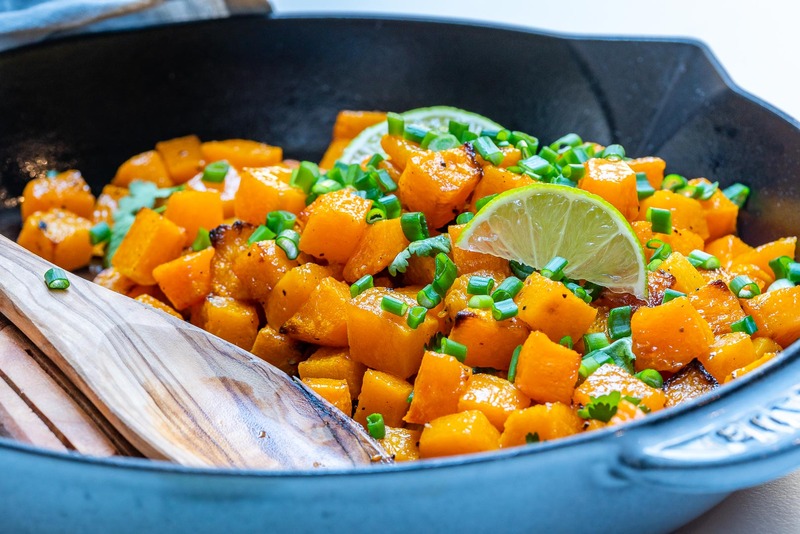 Cook for about 5 minutes more, until the squash is crisp tender – stirring once or twice. Garnish with lime wedges, cilantro and green onions. Enjoy! Be sure to keep a close eye on the squash so it doesn't burn. 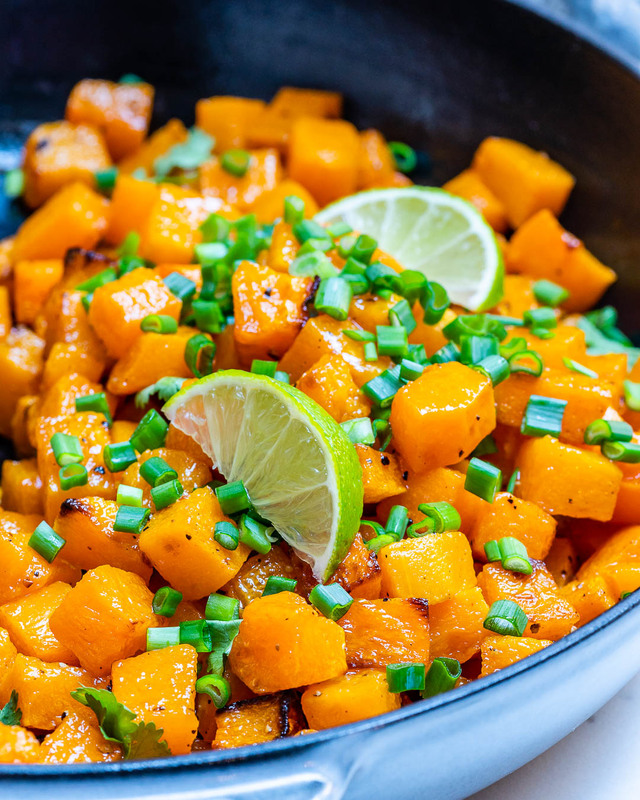 Cook for about 5 minutes more, until the squash is crisp tender - stirring once or twice.